Flying High by Jerry Williamson - 6.625" x 10.000"
Flying High framed print by Jerry Williamson. Bring your print to life with hundreds of different frame and mat combinations. Our framed prints are assembled, packaged, and shipped by our expert framing staff and delivered "ready to hang" with pre-attached hanging wire, mounting hooks, and nails. 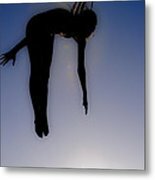 There are no comments for Flying High. Click here to post the first comment. 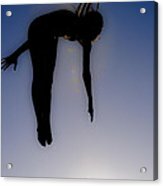 Silhouette of a female springboard diver. Jerry Williamson started photography as an assistant for a wedding photographer nearly 30 years ago. He first went out on his own with a small photography business on the Outer Banks of North Carolina in 1986. For most of the next 20 years he continued photographing his children growing up. Then he started his own business again, His specialty is landscape photography.